Left to right: Don Droppo, president of Curtis Packaging Corporation; and Kerry C. Brown, vice president of operations; feel that their new customized Koenig & Bauer Rapida 106 41-inch 10-color double coater press arriving this spring will be a key press for the Connecticut firm, dedicated to short-run, fast changeover jobs. 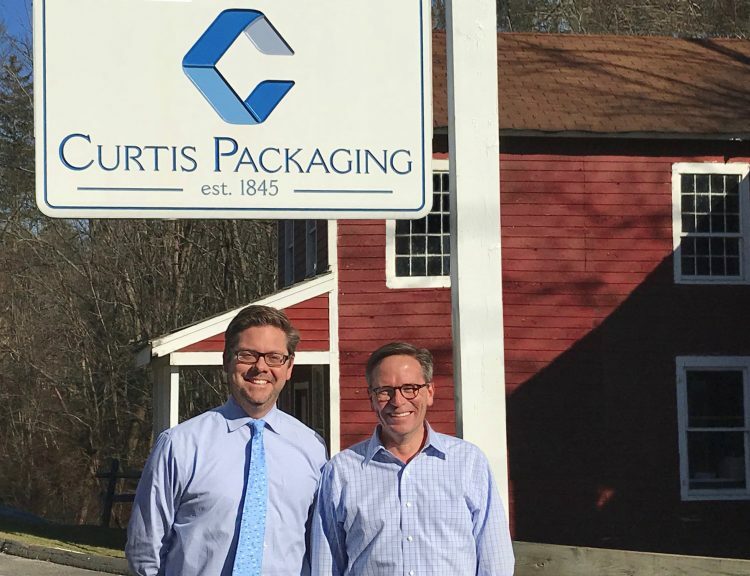 DALLAS - March 28, 2018 - Headquartered in the rolling hills of the Berkshire Mountains of Connecticut amid the leafy ambiance of a quiet upscale neighborhood, Curtis Packaging Corporation opens its red-brick two-story facility to some of the largest, well-known consumer brands in the world. Its intentional motif - a combination between an Ethan Allen showroom and a quaint New England bed-and-breakfast - provides a relaxing respite for its clients to design and deliver some of the most decorated, award-winning innovative and inspirational packaging solutions for world renowned companies that none of its competitors can match. Here in its 150,000-sq.-ft. facility in Sandy Hook, Curtis will soon be taking possession of a new Koenig & Bauer Rapida 106 41˝ 10-color double coater press this spring. The new 41˝ press will join two current Koenig & Bauer Rapida 130 51˝ large format presses while a third Rapida 130 will be removed for the new press installation. Management’s intentions are to leverage the innovations and advanced technologies found on this fully automated 41˝ model to address its significant growth rate with additional specialty coating capabilities. Due to its reputation as a print producer of the highest levels of complexity and innovation, Curtis wanted to maintain its perch as having the utmost inline color control and to distinguish itself among its competitors. To that end, Curtis Packaging chose to have the new Rapida 106 press specified with the combination of Koenig & Bauer inline QualiTronic Color Control capability and System Brunner Instrument Flight print quality measuring system. Having earned worldwide acceptance and notoriety as the leading inline color control system on the market, the Koenig & Bauer QualiTronic Instrument Flight emphasizes color balance and gray balance, taking into account more than 30 process variables. It has been expanded to include new balance control apps and new global standards. The unique five-star appraisal system will notify a Curtis press operator of the print quality achieved under the selected standard and can ensure compliance with different standard specifications every day. “Having this 41˝ press specified in this unique configuration of a double coater lets us print in one pass rather than two,” says Brown. “It makes us more efficient and more innovative. It distinguishes us from our competitors. We already have a reputation for producing a higher level of complexity and innovation. We’re pleased and humbled that brands seek us out to introduce and create new packaging with us. We have a fantastic group of supply partners that knock on our door wanting to launch products with us.” Curtis management was also preparing ahead when it specified that the new Rapida 106 would be prepared for eventual cold foil applications. Brown says that the firm is anticipating its use in the future. For Curtis management, it was critical to be able to record and analyze its press data to ensure excellent print quality. The performance data of the new Rapida 106 press will be automatically captured for analysis via Koenig & Bauer’s LogoTronic Professional, which will provide detailed reports on every activity taking place on the press. The system has also been extended to include Logotronic Cockpit, which provides detailed reports on the OEE performance of the Rapida 106 press. Another important aspect at Curtis is its environmental stance. As consumers and brands have become more concerned about the environmental impact of packaging, they are seeking printers that share their commitment. Curtis has found that its green commitment is a valuable tool for its clients as they can market their products as having a reduced impact on the environment. Curtis has an exemplary environmental record and has placed responsible sourcing and material innovation as its core business practice. It proudly advertises that it is the first packaging company in North America to be 100% carbon neutral, use 100% renewable electricity, and be Forest Stewardship Council (FSC) and Sustainable Forestry Initiative (SFI) certified. In late 2016, it made a $2.5 million renovation to improve energy efficiency at its headquarters.